Big Ag. 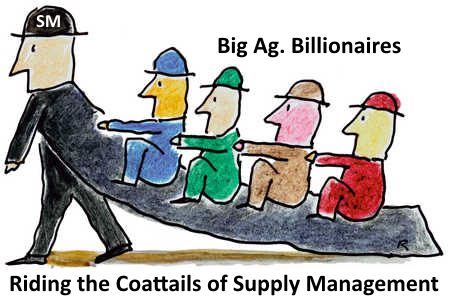 billionaires ride the monopolistic coattails of Supply Management ("SM"). "Deals with the Devil", both parties benefit from the relationship in the short term. Long term, losing your freedom and your soul has significant consequences. Anonymous comments posted on Better Farming recently postulated that retailers enjoy, benefit, and welcome the price stability of SM commodities (dairy, chicken, eggs, & turkey), as it enables steady profits while minimizing consumer anger at high food prices. Do big grocery chains ride SM's coattails too? Big retail grocery chains tend to use 4 basic commodities (bread, milk, eggs, chicken) as "loss leaders" in their advertising and advertising flyers, where they focus their price competition efforts. This theory assumes that if a grocer has excellent prices on these 4 basic foods, customers flock to your grocery store, then you can charge prices as you please on all the other items on your shelves. That may be somewhat true, but there are limits to the retail price gouging that can occur under this method. Groceries have always been a high volume, low margin business, and highly competitive. More recently, grocers complain that it has become even more cut throat and competitive. Walmart selling food in Canada has been a major disruptive force in the marketplace. Some experts feel that Walmart will terminate its grocery sales experiment within the next five years. "Quarterly earnings margins before interest, taxes, depreciation, amortization and rent costs at Loblaw, Sobeys and Metro [the three largest grocery chains] have ranged from 6.5% to as high as 9% over the past two years." I read with interest the recent article on Sobeys in Canadian Grocer. Mr. Marc Poulin said healthier food products introduced into Sobeys over the past year are part of the reason for the recent profit jump at the stores. I also note that the same article shared that "Analysts have said Sobeys faces fierce price competition in the grocery business." On Empire Company Ltd.'s website (Empire is the parent company of Sobeys), it states, "Empire is committed to maximizing sustainable long-term shareholder value by supporting Sobeys’ purpose to help Canadians Eat Better, Feel Better and Do Better while also strengthening our related real estate investments." Sobeys commitment sounds pretty good to me. I hope that Sobeys follows through with their commitment. I asked Empire's Board about that commitment on 2014/09/20 (ie. 100 days ago), and have not yet received a response from them. They must still be thinking about it. In 1996, researchers published their price modeling for the relationship between farm and retail prices for 9 Canadian food staples. In 1986, Canada had 101 chicken processing plants. The four largest processing firms, some of which operate multiple plants, account for at least fifty percent of total Canadian sales for meat (ie. low competition). For chicken, the Canadian concentration ratio in 1982 was more than twice that in USA. Non-SM foods usually passed on less than half of the farm gate price increase. While Canada's chicken processor concentration in 1982 was double the US concentration, it has become even more concentrated by plant closures, mergers, and acquisitions. That research confirms that it isn't just SM farmers who are solely responsible for the unfair gouging of consumers for SM commodities. Those Big Ag. "friends" of SM who ride on the monopolistic coat tails of SM farmers also play a role in unfairly boosting prices of SM foods at retail stores. It was reported to me earlier this year by the Meat Department Manager at a local grocery store that he was selling chicken at a price below their cost ($1.88 per lb., or $4.14/kg), which is roughly the same as US retail pricing. I believe what he told me was true. While it may not happen every day, it appears to happen at least sometimes that some food items are sold at retail prices that are at or below the retail store's cost. Chicken Farmers of Ontario ("CFO") seems to have learned the "boiling frog" method of slow steady price inflation of 3.57%/yr as an insidious attack on consumers so as to maximize the profits of their multi-millionaire CFO members and their Big Ag friends. See Chicken Price Parity: Will It Ever Come? That "boiling frog" steady rate of price inflation for chicken may help retailers as well, just as the BF poster suggested. No affordable chicken for Ontario consumers. lumps of coal for 2 Christmas stockings. Click the image for full size version. Quite a large lump of coal was delivered to the Christmas stockings of 15,500 small flock poultry farmers of Ontario. Unfortunately, 13.6 million consumers in Ontario get a similar lump of coal dropped into their Christmas stocking too. Canadians pay 50% to 300% more for chicken than what the rest of the world pays; thanks to the #ChickenMafia and their self-serving rules to protect their chicken monopoly. Chicken Farmers of Ontario ("CFO", members and leaders of the #ChickenMafia) operates their government created monopoly in favor of the 1,400 quota-holding chicken farmers in Ontario. How is it that 1,400 quota-bearing chicken farmers can hold the entire province of Ontario hostage (all 13.6 million of us) with their self-serving rules that made these 1,400 people into millionaires, and may eventually allow them to become billionaires. Quota-bearing chicken farmers are the highest paid farmers in Canada. The 15,500 Small Flock chicken farmers in Ontario are small, independent, neighbourhood poultry farmers who are limited to raising no more than 300 chickens per year (enough to feed chicken to 10 people at the Canadian average rate of consumption in kg/yr). Most Small Flockers grow less than half the permitted amount of chicken (due to the red tape, costs, and bureaucracy imposed on them by the #ChickenMafia). The Tribunal previously decided to reject Small Flockers' chicken appeal as being frivolous, vexatious, and made in bad faith. The Tribunal called Small Flockers out with three strikes in a row (see Blog posting Case Dismissed: The Appeal Tribunal has Spoken ). After waiting 61 days, we now have the Tribunal's final answer, delivered on Christmas Eve. The Review decided that the appeal stands as-is, but the reasons for refusing the appeal have been changed slightly. Previously, the Tribunal had ruled that this appeal was frivolous, vexatious, and made in bad faith. Any one of those three deadly decisions was enough to kill the appeal dead. The Tribunal decided to brand the appeal with all three allegations, for good measure. With zombies, "double tapping" (ie. killing twice) helps to ensure the zombie never gets up again. Apparently, the subject matter of this appeal was such a menace to the #ChickenMafia, the Tribunal felt it required triple-tapping to ensure the appeal was dead, DEAD, DEAD. Contrary to the Tribunal, the Review decided there was insufficient evidence to support an accusation of being "frivolous". The Review also found that calling the appeal "vexatious" was going too far. Both of these two allegations were rejected by the Review process. However, the Review confirmed the decision that the appeal was acting as an abuse of the Tribunal's processes, and/or in bad faith. That was enough to continue rejecting this appeal. As far as the Tribunal is concerned, this chicken appeal is permanently dead. At this point, Ontario's Minister of Agriculture can review the Tribunal's decision in the next 30 days; rejecting it, or accepting it, or substituting the Minister's decision in place of the Tribunal's decision. If turned down by OMAFRA's Minister, the Small Flockers' last chance is through a Judicial Review. I am no lawyer, but it seemed to me that the appeal (and the request to review) presented some solid case law in support of Small Flockers' search for the restoration of their civil rights, and affordable chicken for the citizens of Ontario. To twist that into a poorly substantiated allegation of frivolous and vexatious meant the Tribunal had gone way out on a limb, past the point of reasonable discretion which allowed the Tribunal to control its own processes. It appears that the Review agreed; the Tribunal had gone too far, and the Tribunal was at significant risk of having their bias exposed and their decision overturned. That could easily explain why they backed off during the review process. As mentioned by the Tribunal's Vice Chair in his review decision, the case law was thin and scant for defining "bad faith". Since "bad faith" is not well defined in the case law, the Tribunal had a wide latitude to define "bad faith" how they pleased; so they did. having a personal political agenda. The Tribunal used all three of these as sufficient reasons for judging bad faith and dismissing the Small Flocker's appeal. Did the Blacks in South Africa have a right and just animus towards the White Minority who persecuted the Blacks during Apartheid? Did the Blacks have a manifesto and personal political agenda under the ANC (African National Congress), for the restoration of their civil rights? Do the #ChickenMafia have animus towards Small Flockers, and a personal political agenda and manifesto to protect their monopoly at all costs? Why are these reasons unacceptable and held against Small Flockers, but all three are OK for the #ChickenMafia? To me, this seems 1-sided and obviously biased in favor of the minority but powerful #ChickenMafia. The lockers' review request raised a number of other reasons to reject the prior decision of the Tribunal. The Review's decision mentioned these other reasons lockers requested be considered, indicating that the Review heard those additional complaints. Any of these additional reasons could have breathed new life into this appeal if any of them had been accepted. However, the review ignored all of these additional reasons from further consideration. I wonder why? It appears that if the Tribunal gets its Christmas wish, the injured rights of Small Flockers, and the unaffordable chicken for all of Ontario will be denied. Small Flockers will not enjoy their right to have their legitimate grievances heard in court. Not only are Small Flockers rights trampled by the #ChickenMafia, the #ChickenMafia have convinced the OMAFRA Tribunal to protect the #ChickenMafia and their dirty deeds against Small Flockers. Lies and more Lies. Will SM ever tell the truth? Dave Janzen, Chairperson of Chicken Farmers of Canada ("CFC"), did an Op-Ed piece in the Ottawa Citizen on July 8, 2014. It appears he was prompted by an opinion piece by Kate Heartfield of the Ottawa Citizen. I have carefully read Kate's Op-Ed essay. I agree with everything she said. However, Mr. Janzen's response is: "Don't chicken out on Supply Management". It seems he's afraid that both Kate's Op-Ed and the recent trade talks (TPP, EU, and others) are significant threats to the millionaire chicken farmers of Canada and their cozy feather bed called Supply Management ("SM"). Those threats prompted his Op-Ed response. Maybe he's right about being under attack on two separate fronts, a dangerous position to be in. Let's review what he said in defense of SM. Mr. Janzen said "As a Canadian chicken farmer, I can assure her [Kate Heartfield] that supply management is alive and well and, frankly, should stay that way." I agree that SM is alive, but is it "well"? I have documented issue after issue of brain dead flatlining by CFC and its provincial counterparts, and the terrible toll inflicted on consumers and Small Flock chicken farmers. It appears obvious that SM isn't well, it's dysfunctional. Yet the millionaire chicken farmers continue to deny, avoid, and resist. So sad. Mr. Janzen said, "Supply management contributes more than $25 billion to Canada’s GDP every year, directly supporting more than 300,000 jobs, while ensuring robust growth for our fellow farmers in the livestock, oilseed and grain sectors." I won't argue his statistics, but I do take exception to the invalid assumptions behind those statistics. SM is big, on that we agree. However, SM strangles the chicken industry in Canada by killing off any hope of significant chicken exports. If SM didn't exist tomorrow, the Canadian chicken market would increase significantly. Secondly, if SM didn't exist, or it let the non-SM system some freedom, those jobs and GDP would still continue, as Canadians would still want to buy and eat chicken. So how does Janzen take credit for jobs and GDP that will exist whether or not SM exists? That is a classic fallacious argument. Janzen said, "For more than 40 years, this system has ensured the success of our country’s dairy and poultry industries by setting optimal production levels and ensuring fair returns for farmers." It is almost 50 years that Canadian consumers have been chained to the wall in the SM dungeon. When do we get paroled? Murderers have shorter sentences than what we have to suffer. It's been so long, it more than meets the definition of cruel and unusual punishment. Janzen says they set "optimal production levels". Check on CAMI Poultry in Burlington ON who can't get sufficient supply of chicken to meet the consumer's need for Hong Kong style chicken (see here, here, here, and here). Have you tried buying pastured poultry? Not available, except from a small flock farmer in the most part, but SM severely restrict small flockers from adequately serving this market. SM doesn't want that pastured poultry market, but they won't let anybody else have it either. That's greed and spite, through and through. conspiracy to regularly raise chicken prices as seen here? Janzen said, "we do not set the price consumers pay at the stores – retailers do." If it isn't SM millionaires who directly control retail chicken pricing, then it is being done by their friends or accomplices with their help and protection. See the graph of retail chicken prices for the last 17 years (the data for 2012 - 2014 is similar, continuing the trend). Just how dumb does Janzen think we are? Pure propaganda! Janzen says Canada's Federal government "fights for market access where Canadian products are in demand, while sustaining excellence at home for products that Canadians depend upon every day — including those provided under supply management." Yes, it's a fight, because Canada's SM system puts us way out in left field compared to our trading partners. 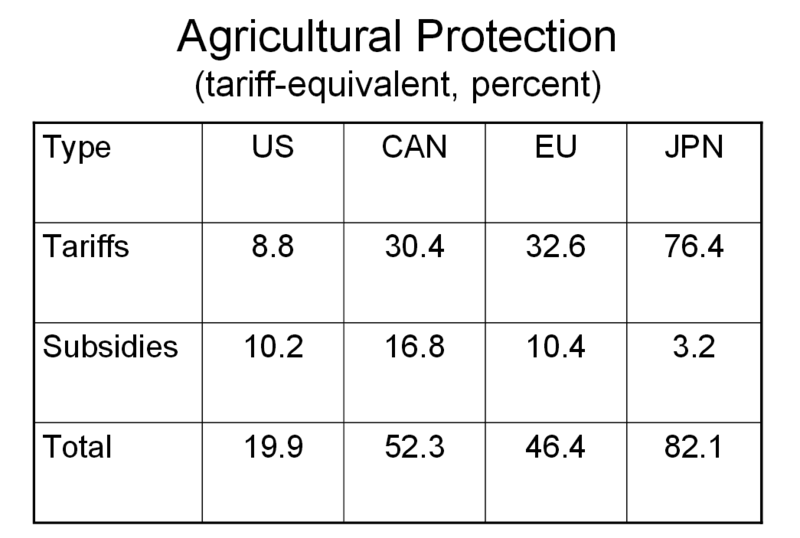 Canada is the 2nd worst (only behind Japan, see here) for agricultural tariff barriers (as high as 285% to import chicken into Canada), and domestic subsidies for the government's friends in SM,. All of our trading partners are very upset with Canada on a chronic basis about Canada's crazy trade policies under SM. "Supply management assures Canadians that they can get a reliable supply of fresh, high-quality food at a reasonable price." That's a joke! Canadian chicken is mediocre at best, and getting worse all the time. Our Canadian chicken is often contaminated with deadly bacteria and/or Superbugs (see here ). Our Canadian chicken productivity (as measured by FCR Feed Conversion Ratio, the biggest single factor in determining chicken prices) is 25% worse than comparable chicken grown in New Zealand (see here ), and Canadians pay 50% to 300% more for our chicken than most others in the world. Nothing but crappy lies by Janzen to fool the public. I hereby challenge Janzen to a public debate of his spurious propaganda against the objective facts and true statistics; whenever and wherever. Is there any national media channel willing to cover and air the debate? I doubt he's foolish enough to accept the challenge. Janzen said, "we are the world’s 15th largest importer of chicken. Indeed, we import more chicken than six of the TPP members — the United States, Peru, New Zealand, Australia, Brunei and Malaysia – combined! Year in and year out we are consistently the second- or third-most important market for US chicken exports." Canada has the 6th largest economy in the world, but we're the 15th largest in chicken imports. What does that tell you? It's hard to get chicken imported into Canada. Canada imports about 25% of our chicken from other countries, all done so it maximizes profits for the SM chicken farmers and their close friends. Most of the chicken we import comes from USA, Peru, New Zealand, Australia, etc. We import it because those countries don't have a crazy SM system that prevents them from exporting chicken. Canada has a crazy SM system, so we hardly export any chicken to other countries (ie. we're in last place of the OECD nations, with just 1.4% market share for chicken exports, see here). The countries Janzen lists generally don't import chicken because their domestic chicken farmers supply close to 100% of the domestic market, plus produce more chicken for lucrative exports. Again, twisting the facts to make SM look better than it really is. Lipstick on a pig. Janzen said, "New Zealand is often cited as the poster child for free trade. But it does not allow a single chicken to be imported thanks to strategically designed non-tariff barriers — in this case, excessively restrictive, so-called “sanitary” rules." Perhaps Canada should learn from New Zealand. Today, more than half of BC is under quarantine from a H5N2 bird flu outbreak that keeps spreading more and more. The Federal government paid hundreds of thousands of dollars to SM chicken farmers so they could develop and implement bio-security systems to prevent these types of issues. CFC blames wild ducks as carriers who infected the BC poultry farms. However, the bio-security rules are supposed to ensure that domestic poultry are separated and protected from contact with wild birds. Annual audits are supposed to be done on every poultry farm to ensure compliance on this issue. How does CFC explain this outbreak of today, especially after it duplicates the last outbreak in BC in 2004, an outbreak of highly pathogenic avian influenza H7N3 that affected about 1.3 million farm poultry birds; an unmitigated disaster. New Zealand has worked hard to have no poultry diseases, unlike Canada. That's typical of SM and Janzen to smear New Zealand's excellence as a negative event. Janzen said, "Every country does what it can to keep its agriculture sectors viable. In most cases, that support comes in the form of massive government subsidies to farmers. Not so in supply management." "In Canada, farmers under supply management do not get a dime of subsidies. As mentioned previously, Canada's SM chicken farmers received a government grant to develop and implement their bio-security system, and CFO received a huge grant from taxpayers' pockets so they could buy German software to help run their office ( see here). So much for Janzen's SM fairy tales. You can believe the truth of Janzen's propaganda, take your pick. Imported Foods: Is Free or Fair Trade a Solution to Affordable Food? Can Canada's Supply Management ("SM") system be replaced (or co-exist) with free trade or fair trade chicken? There are small flock farmers in third world countries who would benefit from additional opportunities to sell their chicken, eggs, and other agricultural products. Since Canadians pay one of the highest prices for SM products, likely these third world suppliers can produce those products far cheaper than Canadian suppliers. I believe Canadians want more affordable food, provided it is safe, dependable, and nutritious. I also believe that Canadians prefer to buy from and support Canadian producers, but are not prepared to be gouged in pricing, or held hostage so as to support Canadian suppliers. In yesterday's Blog posting (see Import Chicken: Help the Poor in both Canada & the World? ), I presented Mr. Cline's research that says the poor, both the first world poor customers and the third world poor suppliers, would benefit from free trade in agriculture products. Expensive, unaffordable food is regressive, as the poor have to pay a far greater percentage of their income to buy that food than what is paid by the rich. If income taxes are adjusted based on an individual's income and wealth, why not food? "A hearing of the US Congress's Ways and Means committee in 2006 unintentionally provided one of the most succinct accounts of the problem I have come across. The Peruvian asparagus industry was up before the house to reassure representatives that any growth in imports to the US from Peru would be in US interests. But Peru doesn't even get the full benefit of that 30 cents, because a large portion of the 30 cents Peru makes comes back to the US anyway: it is spent by Peruvians on US seed, US materials for processing, US fertiliser and US pesticides. US-based vegetable corporations, Del Monte and General Mills Green Giant, have been able to enjoy lower land values, cheap labour and low environmental costs by moving some of their production to Peru. The handful of corporations that dominate the global markets in seed, fertiliser, pesticides, trading, distribution and retailing take care of the rest. Increased agricultural exports have indeed contributed to a growth in Peru's GDP, but the benefit to the poor of its population is hard to see." One Ag. expert thinks that as soon as a WTO trade agreement is announced that allows for free trade agriculture imports, all of the multi-national billionaire Big Ag. companies will use huge amounts of cheap foreign money to buy the best farm land. Next, they would build food production and processing systems in third world countries to export to their sister branch plants in Canada and elsewhere. It is unclear if the third world poor would see any benefit. Perhaps they would get slave labor wages working in those new farms and food processing plants. If the supply chain can get free trade food from third world sources at a small fraction of domestic sources, their profits magnify greatly if they can sell at the same domestic price. Since Big Ag. tightly controls the domestic food distribution system in an oligopoly, there is little competition, so there is no significant downward force on domestic retail prices. Therefore, as long as Big Ag. has tight control of the food distribution systems, there is likely marginal benefits from agricultural free trade, neither for the domestic poor nor the third world poor. Can "Fair Trade" be better than "Free Trade" ? Perhaps Small Flockers in each domestic market are the best answers. Import Chicken: Help the Poor in both Canada & the World? Some experts think the best way to help the poor, both in Canada and around the world, is to allow free trade in agricultural products to occur. Supply Management is the worst offender to this goal, and is therefore a prime target for change. "...those in favour of reaching a deal [ie. reducing agricultural subsidies and import barriers through free trade treaties] say it would be worth many times as much as all of the foreign aid to the world’s developing nations." Not being an expert in international trade (who is? ), I didn't understand what this meant. Today, after re-reading the mainstream media reporting on Mulroney's speech, I noticed all of them included this cryptic comment, but nobody explained what it meant. As I dug deeper and deeper, I finally developed a child-like understanding of this issue. Perhaps I need to research this much more, but I will share what I have discovered so far. If I am all wet, perhaps those in the know will see my obvious error, take pity, and guide me in the right direction. Mr. Cline seems to propose that the fastest and easiest way to reduce poverty on a world-wide basis is to allow free trade for agricultural products. Of course, agriculture is the global-wide bastion of the most pernicious protectionism. World-wide poverty (ie. the "Poor") is generally defined as someone earning less that US$ 2.00 per day ($730/yr). their exports. The lines were added by me. 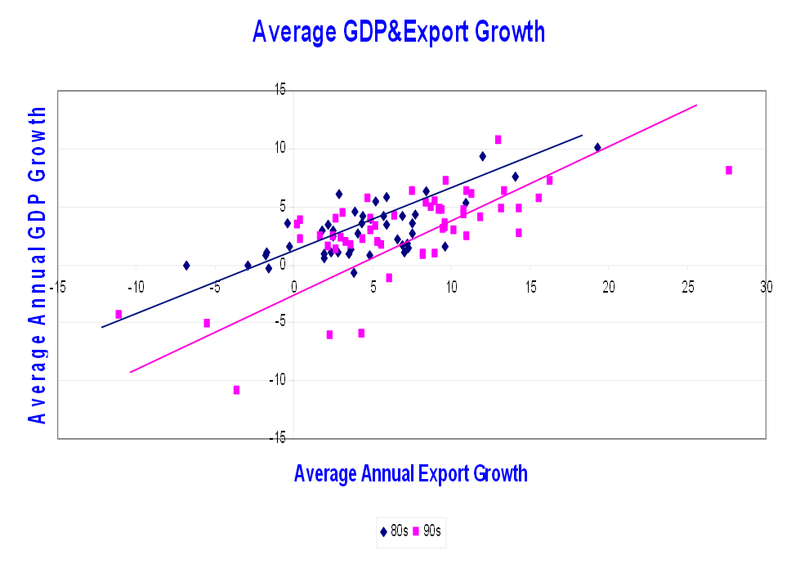 In developing countries, data from the 1980's and 1990's suggest that as their exports grow, local GDP grows also. See Figure 1. That boost to the economies of developing nations via free trade could be as much as $200 Billion per year. Half of that boost would be from free trade for agricultural commodities. The other major sectors for boosting their economies would be from exporting textiles and apparel. 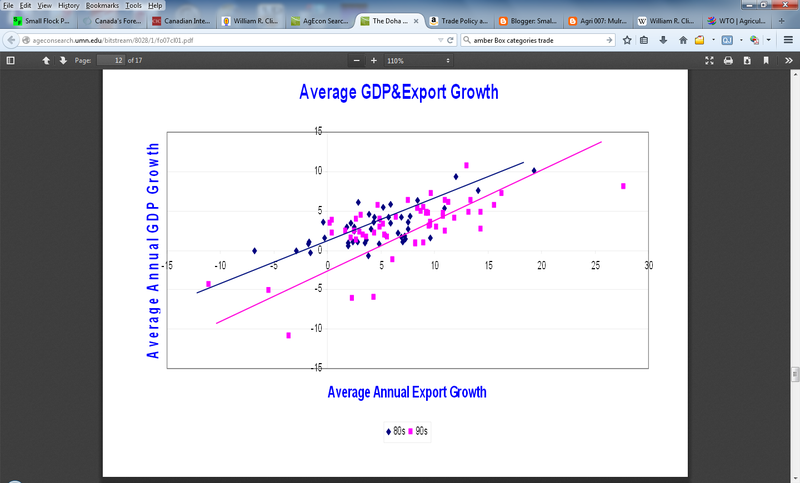 Global free trade would raise the GDP by 1.5% to 2% directly. The dynamic (ie. spin-off) effects would more than double the direct effect, so the total effect (ie. both direct and indirect) would be more than 4%. While the average effect on people would be 4%, the poorest of the poor are estimated to receive the biggest impact of free trade, estimated by Mr. Cline to be double of the average effect (ie. 8% for the Poor vs. 4% on average for all citizens in a developing country). In Mr. Cline's 2007 paper to a USDA conference, he states: "...the broad empirical relationship between poverty and income shows that the “poverty elasticity” – the percent by which the number of poor declines for a 1 percent rise in their income– is about 2. So multiply once again by 2 and you get a total of 16 percent reduction in the number of poor. Apply that to 300 million [sic, appear he meant 3 Billion] in poverty and you get about 500 million reduction in global poverty." Therefore, Mr. Cline concludes that free trade would raise the income of Poor people sufficiently to remove 500 million people from the poorest category (ie. earn $2.00/day or less). Free trade for agriculture is essential to achieving these positive effects for the world's poor. See Figure 2. WTO defines ag. subsidies as colour-coded boxes, similar to traffic light colours (red= prohibited, amber= caution or subsidies that are to be reduced, green= OK in unlimited quantities, plus blue=amber with conditions that limit the quantities that farmers can produce. The protectionism of Japan's farmers is legendary, estimated to be equivalent to an 82.1% import tariff when you count true tariffs (76.4%) and domestic subsidies (3.2%). Canada is the 2nd worst villain in ag. tariffs and subsidies at 52.3%. The EU is 46.4%, and the US is just 19.9%. The weighted average for all industrialized nations is 36%. No wonder Canada is in such huge trouble in trade talks with the US, EU, TPP, and WTO; we're 45% higher in ag. trade barriers than the world average for industrialized nations. equivalent barrier to ag. imports from developing nations. So that is Mr. Cline's theory in a nutshell. I assume that is what was being referred to in the story about Mr. Mulroney's call for the end of SM when it said removing ag. subsidies and protectionism would have a greater effect than foreign aid. In 2012, Canada spent $5.67 Billion on foreign aid according to CIDA's data, which is stingy when compared to our relative wealth and the aid by other OECD nations. About 69% of Canada’s aid in 2012 was channeled through the Canadian International Development Agency (CIDA), 9% through Finance Canada, and 8.2% through the Department of Foreign Affairs and International Trade, while the International Development Research Center (IDRC) accounts for 3.5%. About 33.4% of that aid went to Least Developed (or poorest) Countries, another 2.5% went to other Low Income Countries, and 16.8% went to Lower Middle Income countries (41% is not coded by income group). Africa received the highest share at almost 42%, followed by Asia (22%), and the Americas (17%). Following nearly a decade of sustained increases, Canada's aid spending has stalled and is set to decline in the coming years. As a Small Flocker in Canada, there are a few issues of which I am concerned. First, I have seen the jars of pickles on my local grocery store shelves that have been imported from India. I have eaten some of those pickles, as they are significantly cheaper than N. American pickles and seem to have reasonable quality. I also fret about "what is this world coming to" when Canadian pickle producers have permanently shut their doors, and we are now forced to import from elsewhere. I assume I would feel equally conflicted about SM products of dairy, chicken, and eggs being imported into Canada at the expense of domestic production. Secondly, the quality of N. American chicken is a disaster, with bacterial contamination (including superbugs), bad Omega-3 to Omega-6 fatty acid ratios, bad bird welfare habitats, etc. I assume that 2nd and 3rd world imports might be significantly worse; witness the recent news reports of falsified species in fish imported from South-East Asia, melamine tainted milk in China, and many similar events. As an example of a disaster going someplace to happen, live US chicken was proposed to be exported to China, slaughtered in China, processed and further processed in China to create boxed chicken, then import those packaged chicken products back into the US with no review whatsoever of that entire international supply chain by USDA inspectors (see Blog posting COOL Blowback ). Canadians need higher quality products, not lower. Can we be assured of this quality if we are importing SM replacement products from the developing world? Thirdly, I am cautious of Free Traders and others who pretend to be helping the poor, when in reality they are propaganda shills for Big Ag., the PTB ("Powers That Be"), the NWO ("New World Order"), and the 0.01%'ers. Exactly who is this Mr. Cline? CIC (Canadian International Council) seems to support Mr. Cline's research. Is Mr. Cline a master manipulator, or a straight arrow? For me, it's too soon to tell, but I am wary about trusting too quickly. Fourthly, if SM will not yield any ground to domestic Small Flockers, I assume that international small flockers don't have a chance. I would assume that the poorest of the poor would be small flockers in chicken, and small market gardeners in fruits and vegetables. Fifthly, if WTO, TPP, and EU trade talks achieve agricultural free trade by some miracle, how long before Big Ag. moves in to their third world countries where they create a monopoly for themselves via unfair or predatory trade practices so as to steal the free trade opportunities away from those who need them most. By slowly and carefully reducing Canada's import tariffs and subsidies to Canada's #ChickenMafia, I believe that would be beneficial to Canada's consumers and small flockers alike, and would eventually force Canada's #ChickenMafia to dramatically improve, or die. However, is there a tariff level below which no Canadian chicken farmer can compete, and dropping import tariffs below this threshold will surely kill all the #ChickenMafia, and possibly even Canada's small flockers? If yes, what is that critical tariff level? A lot of questions, conflicts, and inconsistencies currently exist inside of me on these SM trade issues. I assume each of you has a similar list. These are complex issues, and we need to get them right the first time. That is exactly why those acting against the best interests of the majority purposefully cloud the issues so as to protect their special interests. Hopefully with additional study by myself and other, the mud will settle and we can see clearly on the best path to take. SM is Dead: Mulroney's Trial Balloon, or Loose Cannon? In a recent speech, former Prime Minister Brian Mulroney proposed that Canada's Supply Management System be killed off. Was Mulroney asked to launch a trial balloon, or is he a senile loose cannon that is inconsequential to the PC Goverment of today? Prime Minister Steven Harper is crafty. He is a free trader, as evidenced by killing off the Wheat Board, and all the free-trade deals he has inked. However, Harper realizes the hidden (and not so hidden) political forces in Canada. He is under significant pressure from EU and TPP trade talks to curtail the local subsidies and protections from Supply Management for dairy, poultry, and eggs. The Supply Management lobby, combined with their Big Ag. friends (the multi-billion agriculture multi-nationals) are very powerful special interest groups. Harper is still responding to the fall out from nixing the National Wheat Board. He has an election to win next year. How many electors does he piss off by killing Supply Management? How many consumers might benefit from cheaper food and better choices? What to do? No matter what Harper does now, the positive impacts for consumers from killing SM are not likely to magically appear in the next 9 months. That means Harper would stir the pot, upset many people in SM, but would not yet generate the mid-term benefits for all consumers before Canadians go to the polls. Now is not a good time. In politics, it's always wise to hedge your bets. You should always have options to pick from, for the winds of change sometimes blow in many different directions. This is where Mulroney comes in. If Harper can get Mulroney to propose significant change in Supply Management, and it is accepted and applauded by non-SM farmers, consumers, and the main stream media, then the PC's can take the credit, and proudly place it as one of the planks in their platform for the next election in 2015. If Mulroney's trial balloon sinks as it turns to heavy lead, the current PC government can dismiss Mulroney as an old goat or loose cannon, who is no longer coherent, and should be dismissed and forgotten with his wild ramblings. Either way, Harper and the PC's of today are protected and enhanced. Mulroney gets to play visionary, with little downside risk, as SM has to go sooner or later. If the "Kill SM" agenda is delayed, Mulroney becomes the first mainstream politician to propose it, and cements his reputation as a visionary. Martha Hall Findlay, a former MP who ran for the Liberal leadership in 2006 and 2013, also calledfor scrapping SM. Did she lose Leader due to this policy gaff, or did it make her a more renound candidate who unfortunately lost in spite of this visionary policy? Either way, the tide is slowly turning against SM. SM won't like that. They are worried enough to already have hired a CPO (Chief Propaganda Officer) for SM's phoney messages. As it becomes more and more bleak, SM will fight like a cornered rat. They will not go away quietly. It should all make for an interesting time. Small flock poultry farming can't solve the entire food security catastrophe in Canada, but we can help. Chicken, by definition, is the lowest cost meat to produce; supplying high quality protein and fat for the diet at an affordable price. I believe affordable small flock chicken can help Rankin Inlet, all small communities in Nunavut, and the rest of Canada. For example, early explorers found Canada's Eskimo populations to be very healthy in the 1850 to 1900's, in spite of the Eskimo's minimal use of dietary fruits and vegetables. Country meats (ie. meats from hunting wild game) are excellent foods, but today they're somewhat more difficult and more expensive to hunt that 100 years ago. A high carb diet creates too many AGE's (advanced glycation end products) and other nasties that have significant negative health consequences for humans. AGE's and other bad metabolytes require heavy doses of vitamins, minerals, and antioxidents to neutralize the negative effects of a high carb diet. If you don't sufficiently neutralize these metabolytes from a high carb diet, you significantly increate your risk of disease. In some ways, it's almost impossible to eat enough fruits & vegetables to overcome the negative impact of high carb diets. Diets based mainly on country meats and/or chicken, combined with a low carbohydrate lifestyle (less than 60 grams /day of carbs), reduces the need for other dietary vitamins and minerals by 100 to 1,000 times. .
High protein and high fat diets with some green leafy vegetables can make for a balanced, healthy diet which is affordable, even in Rankin Inlet, Nunavut, and other Far North communities. Vegetables are very expensive, and getting more so all the time; especially in the Far North. Many of the commercially grown vegetables are more and more depleted of the vitamins and minerals they used to contain 50 years ago (see the sad tale of potatoes, carrots, brocolli, and other veggies in Blog posting Food Fight ). We pay more $/kg., but get less nutrients per kg of vegetables, so we get killed by the multiplicative effect of these two factors combined. Chicken, grown locally by small flock farmers may offer a key solution to affordable food and healthy diets for Canadians. weather colder than -40 degC. 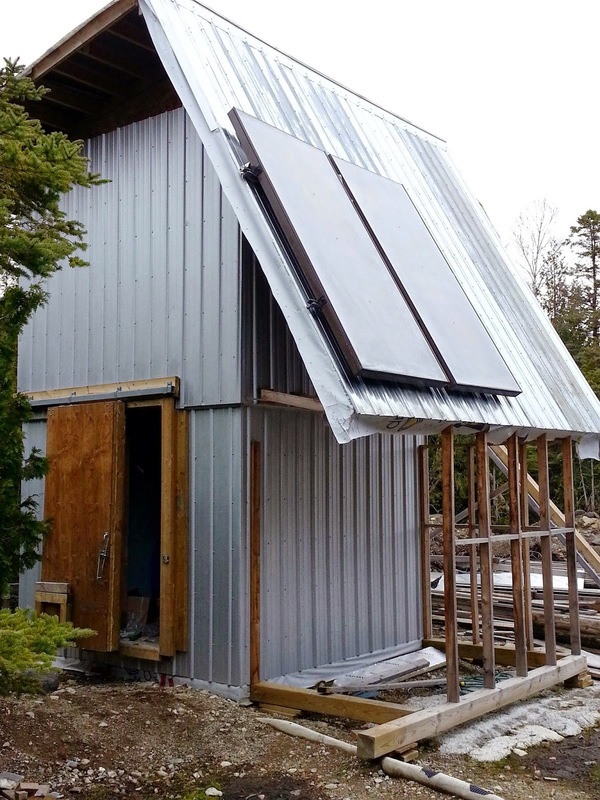 For example, the 10 ft. x 10 ft. all-weather chicken coop prototype design shown in Figure 1 can be placed virtually anywhere in any Canadian backyard or community. This coop can raise up to 650 chickens per year, which yields a steady supply of fresh chickens. This coop can yield about 750 kg. per year of fresh, safe, nutritious, affordable chicken meat. That is enough to feed 22 people for a year at the average Canadian consumption of chicken meat per Statistics Canada. How many coops do you need for your family, neighbourhood, or community? Unfortunately, Canada's Supply Management rules currently make implementation of this all-weather chicken coop system very difficult or impossible. Small flock poultry farmers are discriminated against and prevented from helping their community with the significant production of affordable, nutritious food. Unfortunately, the Supply Management system in Canada, as designed and enforced by the Federal and Provincial governments, has created 2,700 multi-millionaire chicken farmers, oppresses and abuses small flock poultry farmers, and heaps windfall profits into the corporate coffers of billion dollar Big Ag. multi-national corporations; all of which is paid for by Canadian consumers. Canadians pay retail chicken prices that are 50% to 300% higher than the rest of the world. No wonder we have severe food insecurity in rural, remote areas, the Far North, and the urban poor. Some Far North communities receive subsidized foods through the Federal government program Nutrition North. Note that many Far North communities are not eligible for Nutrition North subsidies because they didn't participate in the previous Food Mail program, or other reasons. In addition, the Nutrition North funding is limited, so once the Federal budget of Nutrition North has been spent, the subsidy comes to an end until the next fiscal year. What are Nunavut grocery shoppers supposed to do then, when the subsidy runs out before the end of the year? For an example of why food price subsidies are needed, Grist mentions that chickens sell in Nunavut grocery stores for $65 per pound ($143.00 per kg), so I calculate that a 2 kg whole chicken would be $286.00 in the retail grocery store. This sounds far worse than other reports I have seen (others say $85 for a 2 kg chicken, or $42.5/kg), so perhaps Grist has a typo error, or they meant $65/kg, or it refers to the non-subsidized prices. Even with the subsidy, significant amounts of imported (and subsidized) food ends up rotting on Nunavut grocery store shelves because it's still too expensive, subsidized or not. Nunuvut stores may over-buy, as they don't bear the full consequences, so subsidized food is discounted just before its Best Before date, then the surplus is dumped in the local landfill. What a waste of food and taxpayers dollars while people in that same community are malnourished, or on a starvation diet. It seems Nutrition North subsidizes the importation of food, as contrasted to subsidizing what is actually sold to consumers. If true, perhaps that sad fact could (and should) spark a change that would improve the Nutrition North system. Retailers must ensure that they buy what they need, no more, and be sure to get it sold before its Best Before date expires. Unfortunately today, some of this subsidized food ends up at the dump, where the most vulnerable can finally afford this expensive, subsidized food that is discounted to "free for the taking" at the hamlet's garbage dump. I also understand the retailer's side of the issue, that they risk customers waiting until the food is discounted 50% off as the Best Before date approaches, or pick it up for free once expired; thereby collapsing the grocery store to a free Food Bank. Obviously, the solution has to be carefully designed. It doesn't seem that Nutrition North meets that criteria. Another example of unaffordable food in Nunavut is provided by Price Is Right Nunavut. This Blogger provides a picture of a 1.5 kg meat tray of 4 chicken legs & thighs for $9.74 (which I assume is the Nutrition North subsidized price), which calculates out to be $6.49/kg. ; described as 77% more expensive than Toronto ON chicken prices. I think most people understand that average wages in Nunavut are a small fraction of the wages available in Toronto. If food is expensive in Toronto (bad enough), it becomes impossible in Nunavut (ie. can't get much worse). In the end, Canada (the planet's 6th richest nation) has third or fourth world conditions of food insecurity for a significant portion of its population. Interview with Deputy Mayor Sam Tutanuak of the hamlet of Rankin Inlet's, located on the West coast of Hudson Bay in Nunavut. Sam re-confirms that Elders and children are regularly scavenging food from the town's dump as they are unable to afford to purchase adequate food from the grocery store. Interview with Ms Lucy Wiebe, an Elder in Rankin Inlet, who confirms many of the allegations by the Deputy Mayor, including that she has found children scavenging food at the dump. Lucy relates how it regularly costs her about $400/wk for groceries for feeding just her husband and herself. Lucy cannot get ahead of the financial burden for food, and is always worried about affording food for their next meal. In other words, Lucy has first hand experience, both as a child and now as an Elder, with food insecurity. "Poverty is making people sick because they can't afford food"
"I believe that in this respect Canada is in violation of its international obligations." Facebook group for Feeding My Family has numerous stories and pictures of the struggle faced by Canadian families to feed themselves. People race to the Nunavut dumps to get the best selection of dumped food before their neighbours get it all. Even here, there is competition from the seagulls and other hungry people. Half of Nunavut families are estimated to have food insecurity problems. Prof. Frank Tester, University of British Columbia says Federal Government colonization got started in the 1940's when famines in the Far North killed many people. The government's response was to move people to hamlets, and build external dependency on imported foods, rather than hunter-gatherer lifestyle and country food (ie. wild game from hunting). Prof. Tester confirms that people scavenge food at the garbage dump. Ms Leona Aglukkaq, MP for Nunavut was caught reading the newspaper while MP's were trying to question her in Parliament about Nunavut residents having to eat out of the local dump. She has previously denied on a repeating basis most reports of severe food insecurity in her riding of Nunavut. Most unfortunate, going way beyond just the bad optics. Once we determine the real truth of the food security matter for Canadians, perhaps then the powers that be will consider solutions, even the ones proposed here on this Blog. For other solutions to food insecurity, see one or more of our 321 postings on this important issue for Canadians. Chicken Farmers of Canada ("CFC") protests Barrie McKenna's article published in the Globe & Mail by submitting a Letter To the Editor. Agri007 takes CFC to task for CFC's wacky, indefensible statements. So shall I. The article protested against appears to have been originally filed by Globe & Mail as "It’s time to ensure Canada’s food pricing formulas are transparent, fair" on Nov. 23, 2014 then re-filed under a different title Nothing to crow about: Why Canada's chicken pricing is unfair on Nov. 24, 2014. This Blog had already discussed the Nov. 23rd version in "Smoke & Mirrors for Chicken Pricing & Provincial Allocations". Now we shall discuss CFC's idiotic response. So what great rhetorical arguments and objective evidence does CFC present so as to blow the Globe & Mail and its veteran reporter out of the water? "Just look at the Consumer Price Index: In the past year, beef rose by 19.4 per cent, pork rose by 14.4 per cent and chicken rose by only 2.7 per cent. In the past two years, beef prices rose by 23.1 per cent, pork rose by 18.1 per cent, and chicken? Well, again, it only rose by 5.1 per cent. Chicken is consistently the best value in the meat counter." It is agreed that chicken price increases have been significantly less than beef or pork. I have already reported on this issue in our Blog posting Meat Price Mania. If fact, I complemented the #ChickenMafia on not following the example of excessive price increases implemented for all the other meats tracked by Statistics Canada (eg. beef, pork, canned salmon, weiners, bacon, etc.). The #ChickenMafia has implemented a policy to steadily increase prices of retail chicken at 3.54%/yr (Jan. 1995 - Dec. 2012), which has recently been increased to 3.79%/yr (Sept. 2010 - Sept. 2014). This is the "boiled frog" technique, which is insidious, stealthy, and highly effective for the sleepy consumer. Of course, this can only be accomplished by an illegal cartel via price fixing, or Canada's Supply Management rules that exempt the #ChickenMafia from charges of price fixing rule that all other commodities and corporations must obey. CFC fails to mention the end result when you increase prices by 3.54%/yr for 17 years and 3.79% for 4 years. The end result after 21 years are chicken prices that have been inflated by 653.3%. Mentioning that sad fact must have slipped their mind. 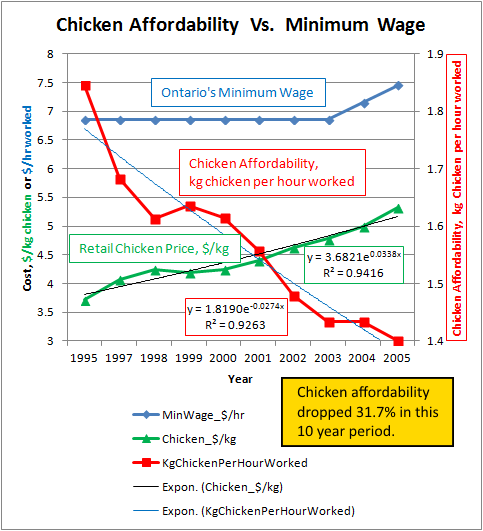 I have discussed how those who live off Ontario's Minimum Wage have seen the affordability of chicken decline by 31.7% over the 10 year period of 1995 to 2005 see Blog posting Unaffordable Chicken In Ontario. That must have slipped by CFC's attention as well. Beef, pork and all the others operate in a somewhat competitive, efficient market, complete with price discovery via natural market shortages or excesses. For example, if everybody is doing BBQ in the summer, and the stocks of hamburger, ribs, steaks, etc. are being quickly depleted, then the prices quickly rises. Similarly, when the meat is reaching its "Best Before..." date, the prices get slashed 33%, then 50% so as to help ensure quick sale before the meat expires and it must be thrown out at a total loss. CFC asserts, and Globe and Mail assumes, that #ChickenMafia only sets farm gate live chicken prices, and all other prices are set "naturally". If that is the case, how does CFC explain the constant rate of increase in retail chicken prices over a 19 year period (or longer)? If it isn't CFC who tweaks the retail price dial, then exactly who is it? After 3 years of investigating this mysterious control mechanism, I have no proof, I have no rumor. It is all a secret blackbox system hidden from view. If anybody wants to hint or disclose, post a comments, anonymours or otherwise, or send me an email. However, the Federal and Provincial governments have given sweeping powers to Supply Management. Under the various pieces of legislation, regulation, and MOU's (Memorandums of Understanding), Supply Management is responsible for and has the duty, powers, and authority to control sales, marketing, shipping, storage, distribution, and pricing of their respective commodities, as well as all processed products that are made, in whole or part, from their commodities (eg. frozen chicken fingers in a cardboard box, chicken TV dinners, etc.). For CFC to insist that they only control farm gate live chicken prices is disingenuous and misleading. If CFC chooses to not exercize its powers for whatever reason, they cannot turn around and say they are not responsible for the resulting chaos when they fail to monitor, command, or control as they should. To be responsible and then fail to act is either incompetence, or negligence, or corruption. "live price of chicken has declined 1.6 per cent and over the past two years it is down a huge 9.9 per cent." We agree, but CFC fails to mention why. Ontario Farm Products Marketing Commission ("OFPMC") ordered Chicken Farmers of Ontario ("CFO") to reduce their Feed Conversion Ratio ("FCR") by 16.3% (see Blog Posting It's Alive!). Through false and fraudulent FCR's, CFO collected windfall, unearned, and fraudulently gouged income from Ontario consumers for up to 10 years for an aggregate total ill gotten gain of about $10 Billion. When OFPMC ordered a proper FCR, I predicted farm gate prices should drop by 9.78% in Aug. 21, 2013. CFC now claims prices actually dropped by 9.9%. Funny coincidence, 9.7% vs. 9.9%, seem pretty close to me. I agree, and believe CFC will agree too, that Ontario chicken prices tend to set the standard throughout Canada. When Ontario chicken prices move up or down, the prices throughout Canada tend to follow Ontario's lead. That is why when CFO was ordered to lower Ontario prices, the rest of Canada soon followed, and Statistics Canada reports a 9.9% drop as the Canadian average. CFC then uses a unique equation. Farm gate prices going down while retail prices go up is somehow equated to be objective, iron clad proof that farm gate prices received by the chicken farmers is fair. What? Back up a little. I missed the logic. Go slower and explain each step in complete detail. Where did you get that logic from? Obviously we have smoke & mirrors and slight of hand. A logical non sequitur. CFC claims that dismantling Supply Management will only threaten the small farmer with no benefits. I, and others claim, that SM can be significantly changed, or totally dismantled in a careful manner so that damage or chaos are avoided or minimized, and unmitigated losses that do occur can be financially compensated. If nothing can be changed because there is the slightest risk to 1 or more people on the planet, then this is reason enough to stop all change, whether the changes are good or bad. Obviously, CFC cannot justify that extreme position. "The biggest determinant of consumer price is where and when you shop." It is agreed that when and where someone shops for chicken can have a significant effect on the prices paid. However, Statistics Canada data which I have quoted in the Blog postings referenced above, is Canada-wide, for big and small retail stores, in big and small cities. The data trend is clear. 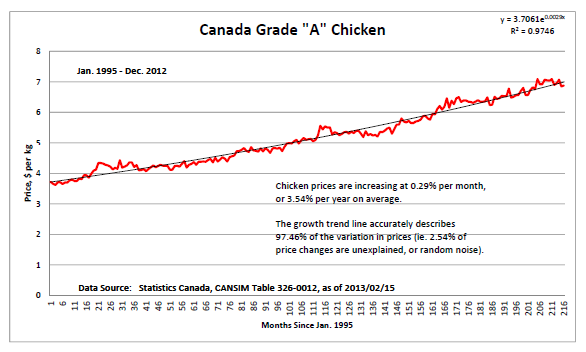 Somebody is controlling Canadian retail chicken prices for more than 19 years. This "boiled frog" steady inflationary price increase for retail chicken explains 97.46% of all variation in retail chicken prices. I would therefore suggest that when and where you shop is less than 2.6% of the overall price influence. As usual, CFC is all wet. It appears CFC wishes to spew out its false propaganda to protect their cushy, high paid jobs, and their multi-millionaire friends.